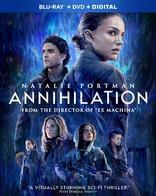 Lush with a visual beauty and sense of wonder that hypnotizes the audience, Alex Garland's Annihilation is a thought-provoking sci-fi drama exploring our innate self-destructive behavior in light of humanity's possible extinction. The film crash lands on Blu-ray with a lovely video presentation, an awesomely immersive Dolby Atmos soundtrack and a strong set of supplements, making the overall package Recommended. 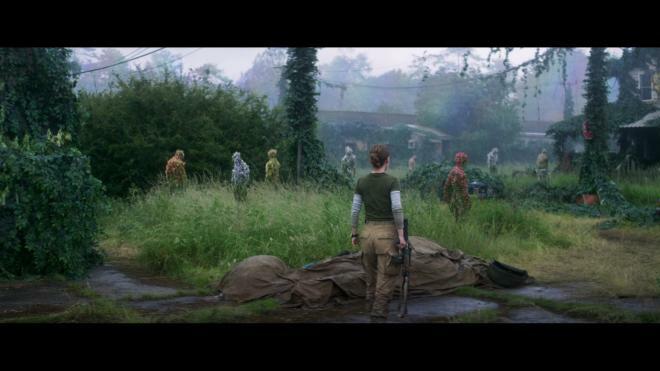 Based on the novel of the same name by Jeff VanderMeer, Annihilation is a gorgeously mesmerizing sci-fi film lush with a visual beauty and sense of wonder that hypnotizes the audience. 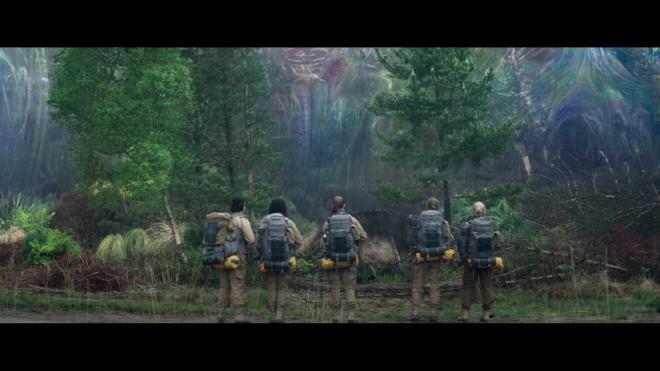 At its center is a mystery circling five women determining the origins and purpose of an alien species that crashed near the Gulf of Mexico coast, creating a strangely colorful and translucent electromagnetic field dubbed "The Shimmer." Previous expeditions into the mysteriously beautiful dome have failed, and scientists have discovered it is growing and will continue to do so until it consumes the entire planet. In other words, as suggested by the title, the film is essentially about an impending apocalypse, making it one of the most visually stunning and captivating movies about the end of the world. But as is also implied by where the aliens crashed — the Gulf of Mexico is ground zero for another asteroid impact that caused a massive worldwide extinction event 66 million years ago — there is more to humanity's annihilation than beauty. One of the more unique and haunting aspects of the film, the latest feature from Ex Machina creator Alex Garland, is the extraterrestrial visitors going against the norm. The plot is not the typical alien invasion flick where little green men with hostile, malevolent intentions obliterate the planet in a some enormous, CGI-infested spectacle. As described by cellular biology professor Lena (Natalie Portman), the foreign invader is more like a cancerous growth without any knowledge of right or wrong or possess a specific objective, but it rapidly adapts to its host environment recombining and merging — or more like evolving — all life at the DNA level into something new. 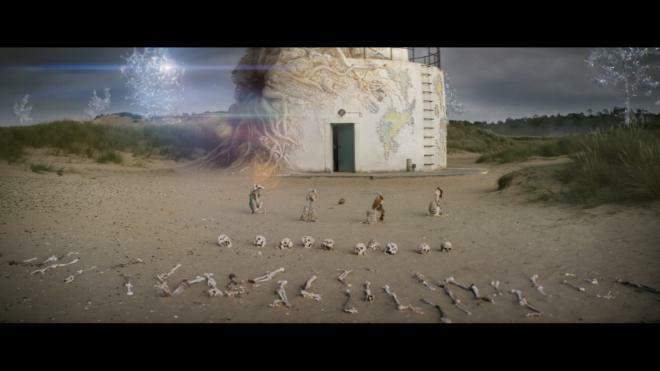 Touching on one of many of the film's underlying, thought-provoking themes, the invasion is not about ending life but rather, about producing more; less about destroying it and more of drawing a deeper connection and uniting the planet as one life. However, as is the obvious case, and which has been repeated throughout Earth's history, new life comes unfortunately from the extinction of another. For a more in-depth take on the movie, you can read our review of the day-and-date 4K Ultra-HD Blu-ray release HERE. Paramount Home Entertainment brings Annihilation to Blu-ray as a two-disc combo pack with a flyer for an UltraViolet Digital Copy. The Region Free, BD50 disc is housed inside a blue eco-vortex case with a DVD-9 on the opposing panel and a glossy slipcover. After a few skippable trailers, viewers are taken to a static menu screen with music. The end of life on Earth crashes onto Blu-ray with a lovely 1080p/AVC MPEG-4 encode, the perfect way for enjoying what has to be one of the most beautiful movies about extinction ever. Faithful to the stylized cinematography of Rob Hardy, the freshly-minted transfer, taken directly from a digital source, starts with a slightly restrained contrast, given the picture a somewhat overcast and dour appeal. Once inside the shimmer, the picture noticeably brightens, paralleling the plot's theme and ideas of unconstrained life flourishing. Similarly, much of the palette feels subdued until after the characters begin experiencing the evolutionary strangeness of the shimmer where primaries suddenly appear resplendent and glowing. At the same time, the presentation is awash in a wide, lush array of sumptuous secondary hues, from the liquid-like, translucent walls of the shimmer or the strange glow from the lighthouse to the radiant, effervescent quality of the new plant, animal and fungi life growing everywhere. Brightness levels don't appear to be greatly affected by the filmmakers' creative photography. In fact, the 2.39:1 image is layered with plenty of rich, opulent blacks, displaying excellent gradational differences between the clothing and military equipment. With many scenes taking place at night and during poorly-lit environments, thankfully shadow details are outstanding, revealing the smallest object in the darkest corner of the frame. The rest of the video is razor-sharp with superb definition in nearly every frame, including the many CG sequences. From the stitching and threading of the clothing to individual hairs, the tiny leaves of plants and the rough bark of trees, viewers can distinctly make out every aspect of this new rapidly-evolving world and appreciate the amount of creativity that went into designing it. Facial complexions appear healthy and revealing with the smallest wrinkle, pore and negligible blemish made visible during close-ups. Paramount includes the same Dolby Atmos mix on the standard Blu-ray that can be found on the 4K Ultra HD Blu-ray. What better way to enjoy the end of the world as we know it than in a gloriously immersive Dolby Atmos soundtrack, submerging the audience into an otherworldly reality filled with bizarre creatures and fantastical sounds. Similar to the video, the audio design feels a bit restrained during the film's first quarter, placing more attention on the dialogue and the intimate conversations, displaying exceptional clarity and tonality in the vocals. When the characters approach the shimmer, the alien aura comes with a strangely haunting hum that not only fills the entire soundstage but also spreads into the top heights, creating an overwhelming half-dome wall of sound. The mid-range during those same moments exhibits fantastic detailing and definition in the higher frequencies, maintaining superb precision and fidelity across the entire front soundscape. At the same time, the hum produces a ground-shaking, couch-trembling rumble that energizes the whole room, providing the shimmer with an eerie, foreboding presence. 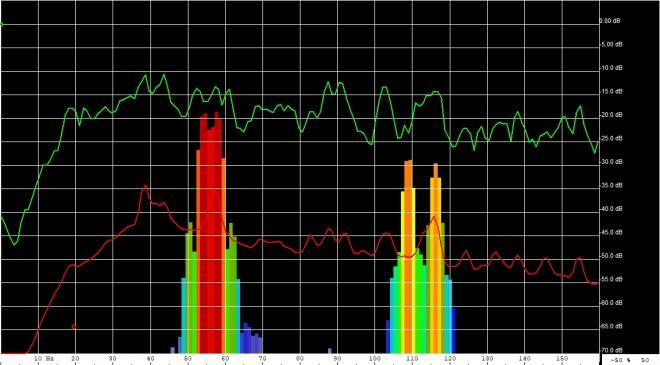 For the rest of the movie, the low-end is robust and hearty, giving gunshots and the few action sequences an appreciable impactful punch, occasionally hitting as low as 18Hz in a few places, especially towards the end (bass chart). Further plunging the listener into the middle of this fantastically alien world are all the haunting and bizarrely beautiful noises suggesting an environment teeming with life. The design feels continuously busy and swarming with the natural buzzing melodies of crickets and flies all around, along with the chirping of birds or the wind blowing through the leaves of trees in the distance. These same atmospherics can be distinctly heard panning across the overheads for a majority of the film's runtime, terrifically generating an enveloping, hemispheric soundfield. Simultaneously, the unusually weird and eerie score by Ben Salisbury and Geoff Barrow bleed into the surrounds and ceiling channels while also employing the subwoofer with pleasing effectiveness and depth. This is not the sort of object-based audio mix meant to overwhelm the viewer or could compete with the more traditional, bombastic actioner; rather, it's a subtle aural experience that's quite satisfying and compelling. All the same supplements are shared with the day-and-date 4K Ultra HD release, which can be read in more detail in our review of the 4K Ultra-HD Blu-ray release HERE. 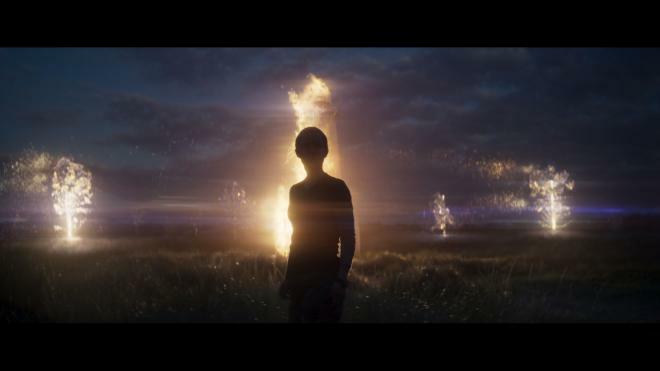 Based on the novel of the same name by Jeff VanderMeer, Alex Garland's Annihilation is a gorgeously mesmerizing sci-fi film lush with a visual beauty and sense of wonder that hypnotizes the audience. At its center is a mystery circling five female scientists led by Natalie Portman and Jennifer Jason Leigh curious to understand the origins and purpose of an alien species slowly engulfing the natural habitat of the southeastern coast and terraforming the area. The thought-provoking sci-fi drama crash lands on Blu-ray with a lovely HD video presentation and an awesomely immersive Dolby Atmos soundtrack. With a small but nonetheless satisfying set of bonus features, the overall package is Recommended for fans of the film.